Artworks artist Janet French has recently begun an exciting collaborative art project with another artist, the printmaker Emma Buckmaster. The aim of this project is to produce a series of etchings of native tree species printed on to paper created from the trees’ own leaves. 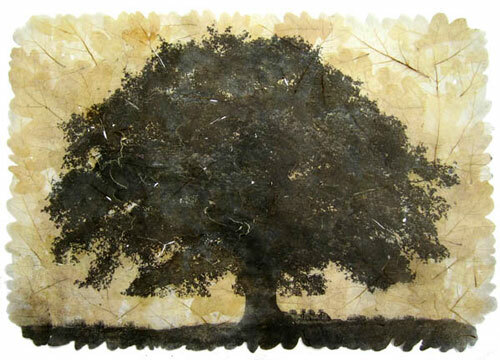 Once completed, the delicate prints are trapped between two sheets of glass and framed to allow light to enhance the fine details of the image and the translucent quality of the leaves. Five tree ‘portraits’ have now been completed and they are currently on show, together with other new work by Janet and Emma, at The Assembly House in Norwich, Norfolk. The exhibition runs from Friday 2nd December 2011 to Monday 2nd January 2012, open Monday to Saturday, from 9am to 5pm. The flowers of the Common Lime have a narcotic effect on bees which may be found asleep under the tree. The branches are full of mistletoe and the leaves have been used to make the paper on which the tree portrait is printed. Emma and Janet currently co-Chair the Gainsborough’s House Print Workshop in Sudbury, Suffolk. 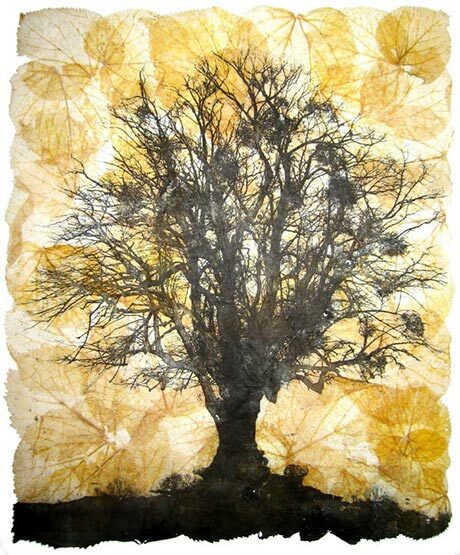 This entry was posted in artworks news and tagged artworks, east anglia, emma buckmaster, exhibition, gainsboroughs house, handmade paper, janet french, norfolk, norwich, printmaker, printmaking, trees on December 15, 2011 by admin.